WizFile is a free portable search program for Microsoft Windows devices to find files stored on the device it is run on quickly. Windows Search has never been great when it comes to finding local files quickly. It is rather slow, requires indexing, and there is always that slight delay before search starts. Third-party programs like Everything, FileSearchy, UltraSearch or SwiftSearch were designed to address the shortcomings of Windows Search; WizFile, created by one of my favorite software developers Dominic Dumée, is a brand new program that is very fast and powerful. WizFile is offered as a portable program or a program that you can install on a Windows device. It is compatible with 32-bit and 64-bit versions of Windows starting with Windows XP. The program loads file and folder information to memory on start. The initial scan is very fast and did not take longer than two seconds or so on my system. It should not impact or delay searching as it finishes probably before you even start your first search using the program. The application keeps the data in memory and does not store it on the drive temporarily. While that is great, it means that it uses quite a bit of memory while active (it used 450 Megabytes on a Windows 10 Pro test system with a lot of files). This is a trade-off and could make the program unusable on low-memory devices. Update: version 1.03 of the program reduces memory usage significantly, especially on 64-bit systems. WizFile uses a similar interface as Bulk Image Downloader and WizTree, two popular applications by Antibody Software. Results are populated immediately when you start to type. It does not matter if you type a single character, a word or more complex search phrases, the matching list of files is returned ultra-fast. Each file is listed with its name, path, size, modification date, and attributes in the program interface. A double-click launches the file immediately and the keyboard shortcut Ctrl-E opens the folder it is stored in in the default file management software (you may also right-click and select the option). A tap on Del deletes selected files to the Recycle Bin and Shift-Del deletes them bypassing the Recycle Bin. The main menu and right-click menu lists other options such as opening a command prompt window at the location, copying the path, or running refresh or rescan operations. WizTree monitors the file system for changes while it is active and will update the search results automatically based on the monitoring. You can give this a try by searching for * (wildcard) and selecting the modified date sort order by clicking on the "modified" header in the program interface. New files are added to the results automatically so that you may use the program to monitor the file system for new files this way. The default search looks for matching file names only by default; you may switch to search matching the entire path instead in the interface. The latter includes folder matches next to file name matches in the results. 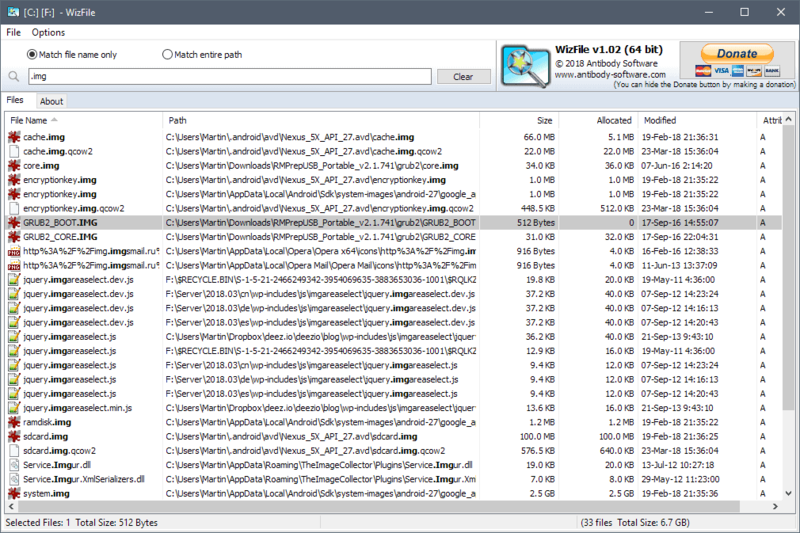 WizFile displays the size of each folder in its interface if folder results are returned. Search supports wildcard characters -- * and ? -- but no regular expressions. You may combine search queries to run AND or OR searches. Just add multiple search terms next to each other to run AND searches (include all), and use the pipe character | if you want to run OR searches. finance -- searches for all file names with the matching phrase in the file name. finance*.pdf -- searches for all PDF documents with the matching phrase in the file name. *.mp3 -- returns all mp3 files. *.mp3 jazz -- returns all mp3 files with the matching phrase in the file name (an AND search). *.jpg | *.png wallpaper -- to find all jpg or png files with the matching phrase in the file name. WizFile is a very fast local file search tool for Microsoft's Windows operating system. It runs well out of the box and keeps all data in memory. That's great for speed and portability but means that the program's memory usage is relatively high. Search is powerful as it supports AND, OR, and wildcard searches, and because of how fast results are returned. WizFile does not support in-content searches which Everything does. Now You: Which search do you use to find local files on your system? Everything has always been reliable, I’ll probably continue to use it. I just tried out WizFile. It’s incredibly fast. >What makes WizFile so fast? >When scanning NTFS formatted hard drives (most modern hard drives use this format), WizFile reads the hard drive’s Master File Table (MFT) directly from the disk. The MFT is a special hidden file used by the NTFS file system to keep track of all files and folders on a hard drive. Scanning for files this way completely bypasses the operating system (Windows) and provides a huge performance boost. Why can’t windows search do that? Agent Ransack. While it continues to work, I won’t bother with anything else. This. I liked it so much, I opted to get the paid version. Can’t believe there is anything better than or even as good as Agent Ransack. Like Anonymous, I purchased a license. They changed the name to File Locator Pro. I wish they’d go back to Agent Ransack. Everything is everything you need! Speed and results? both programs are identical. So for me, i’ll stay with Everything as it did its job for many years now! On my system : 326,5 Mo for Wizfile… against 4,2 for Everything. Memory is not an issue if you have plenty of it. I agree that it is problematic if your system memory is used up almost all the time already. I have no idea why your Everything uses this little memory, it is even less than the minimum usage mentioned in the FAQ on the voidtools webpage (which says that a fresh Windows install requires ~14MB RAM). It basically does the same as WizFile, in that it uses an in-memory database to provide quick search results. In my case ~ 3,665,000 objects amount to 308MB RAM usage. That’s not exactly little, but the benefits are worth it. I’m under Win 8.1 x64. Martin, what do you mean by in-content searches? To me it means one can search for text inside a file.- I tried it with Everything but it does not work. You can use Everything to search in content, see https://www.ghacks.net/2017/06/07/everything-desktop-search-review/ and there “content searching” in the article. When Everything is launched it needs 1-2 minutes to reload what it calls the database. With WizFile that is almost instantaneous. When both are launched there is no difference in speed performance between the 2 apps. On my Win 8.1/64-bit system Everything takes up 42 Mb, WizFile 165 Mb. WizFile comes from the same author as WizTree. And WizTree has important bugs. Just right-click on a partition drive (not folder !) in WinExplorer and select WinTree. WizTree will shows you occasionally big differences for Size and Allocated size for some big files (> 1 GB). Allocated size for partitions is calculated in a different way than the sizes of folders. If WizFile has the same level of software quality as WizTree then forget it! Once upon a time, Windows XP and previous incarnations used to include the option to search for a word or phrase in a file. That seems to have disappeared from Vista onwards. Do any of the search tools you mentioned include such an option Martin? I’ve turned off indexing which probably explains why the OS can never find what I’m looking for. By the way, I note the “Donate” option on the WizTree UI includes credit card options. Can you not include those as a means of donating to Ghacks, Martin? Everything is so fast, it’s easier for us to go online and download it to a machine we’re working on than to drill down to the system file we’re looking for. Windows search is terrible! Correct me if I’m wrong, but a lot of these tools use MFT, which appears to be able to yield very fast results without constantly indexing. I am at a loss to understand how Microsoft cannot achieve something that developers of these neat, well coded tools, seem to be able to do with a fraction of the PCs resources. I also had a devil of a time to try and stop the Windows search indexer. All the things that should have stopped it didn’t, and eventually, I got rid of it. It’s a serious resource hog, and there are also privacy implications. Once again, neat, third party tools to the rescue. Forgot to say, I use Ultrasearch, + SearchMyFiles, + Fileseek. Any way to turn off that ugly bar? Looks like a banner ad? To be clear I’m talking about the whole bar, not just the donate button. Why this is recommended over others – what does it add? Swiftsearch is effectively instant local searching; and while FileLocator/Lite (Agent Ransack) may be quite a bit slower it is still less than 1 sec for a simpe search on my quite old pc and allows searching within files as well as very flexible filtering. Everything requires an index, so less keen on that, and I prefer a blank initial screen. I LOVE Everything (Search). In fact, I use it in combination with Revo=Uninstaller and a reg hack called “Take Ownership” in locating and ridding my computer of hard-to-delete files and certain malware.
. . . so that’s that . . .
I’m still using HDDB, but it’s getting long in the tooth and it’s showing. I hope this won’t get abandoned like that. I use UltraSearch. I like it as it allows me to drag/move any of the search results to another folder. Some others I tried (e.g. FileLocator Lite) can’t do that, and will rather copy the files even if they are on the same drive. In fact, with UltraSearch you can right click a result to access all those familiar functions, such as making shortcuts. But I wish it could put all the shortcuts in a selected folder instead of the source folder. I tried one search software that put them on the desktop, which was better, but not that great if you are making hundreds of shortcuts. Another cool trick Ultra Search can do, is you can search for several files all over your system and then drag the results into Advanced Renamer. From there you can rename them and save, without having to go dig through many folders. I take it WizFile should be able to the same. That said, thanks for the tip, I will give WizFile a try as it has features that UltraSearch does not. I just hope it can moves files instead of making a copy. I really like Everything, but for content searches I use Exselo Desktop (free for individuals). Thanks for the link/article, Martin, on using Everything to search content.